this pamphlet has three sections (just scroll down). First I give suggestions for containing and displaying plants. Then, in section 2, you'll see advice for low light conditions and dry or humid rooms, as well as what to do for plants when you go away. ection 3, 'Plants By Style Or Type', gives care notes for numerous species grouped by their characteristics (trailing, spiky, strongly patterned, etc.). TIP: If you're buying new pots and wondering how to coordinate them with the rest of your décor, keep in mind that a crisp white pot sets off every kind of plant beautifully. White is elegant, uplifting, and allows groupings of plants without clashing. Another colour choice I favour is blue -- navy or light blue. Perhaps you'll find a stripy pot that has a mix of white and blue. The flat-backed wall pot shown below is painted ceramic, a fresh look that looks good just about anywhere. Just as plants don’t care what names we give the rooms they’re in, so also they have no interest in their containers. It’s us and not them that are bound by convention: the plant that is standing in a converted toothbrush-holder feels no worse off than the occupant of a fine Italian vase. From a plant’s point of view, the most important thing about a container is what goes in it — the potting mix — and what can puddle at the base or flow out of it, namely water. Containers made of porous material such as unglazed terracotta will tend to lose moisture through their sides; while glazed, plastic, resin, or fibreglass ones are non-porous and thus reduce evaporation. Terracotta pots, designed for use outdoors, may certainly be used indoors; possibly the plants they hold will want watering just a little more often. A certain amount of improvisation is always allowed with plants, and may result in some charming though unexpected displays. Let’s say that you have a collection of small species with similar watering needs—ferns or cacti, for example. A chimney-like, narrow pot doesn’t accommodate them all, and anyway it raises the plants too high for easy viewing and doesn’t look the right shape. You could split them up into separate small pots, and then group these or place them at slightly different levels. They don’t have to be the same sort of container. Why not have a bit of fun and have some greenery emerge from a teapot? If instead you want your small gems planted together, a more suitable pot for showing them off might be something comparatively broad and squat. But you haven’t got a broad, squat container—or do you? Take a look around. What about that china salad bowl or glazed baking dish that you got for Christmas and rarely use? Either one could be perfect. Maybe there’s a wooden bowl, but it wouldn’t stay watertight. No matter, you can drill holes in the bottom and put it on a lined tray. What about that bamboo basket or wicker hamper that now has nothing in it? That will work, too, once it’s lined with sturdy plastic. Or take the glass lampshade off a lamp you don’t want and put a saucer underneath it. The point is that not every container must be purpose-bought. Some of them can simply be ‘found’. The pursuit of variety does not have to be complicated, never mind expensive. A large, clear bell-shaped glass, known as a bell jar or cloche, can create a new look for a plant simply by being placed over it. A cloche excludes draughts and increases the humidity around the plant—all the more so if the cloche rests on a tray filled with water. As with other containers, a cloche can be bought or it can be improvised with a glass vase or similar object. Fully enclosed, portable glass houses are known formally as Wardian cases, after Dr Ward, who invented them. They are more generally known as terrariums (or terraria, for the Latin-minded), which provide a congenial environment for moisture-loving plants and look decorative while they’re doing it. You can rest them on a table, shelf, or bench, or get a free-standing one on stilts. The More the Merrier: The effectiveness of clusters or groupings. When one has only a few plants, the urge to spread them around is virtually irresistible. Taking them on their first journey through the home, one might as well sing ‘Old Macdonald Had A Farm’, with a small plant here and a big plant there, ee-I ee-I O. Each plant stands proudly independent, and even a little one has a certain prominence simply because it’s by itself. Yet sometimes, plants look as though they might prefer some company. A sign of this is when you see a lonely pot and think, ‘Well, it’s a start’. It may be that a bigger specimen would be more suitable for that spot. But if there’s room, why not ignore the size for once and just fill the space with whatever takes your fancy, in greater number? Instead of having a solitary individual, throwing its shadow starkly against the wall, why not create a lush corner? Clustering plants together gives you the benefit of all their various shapes and styles; the collection is like a picture whose lines and colours engage the viewer, and lead his eye around the canvas. Imagine your space as a canvas to be filled, except that it has three dimensions. There’s no need to be concerned about clutter. Clutter is easily created with furniture and knick-knacks, but plants, for whatever reason, simply don’t contribute to a sense of clutter: it is very hard to overdo it with plants. Twenty is a large number when it’s cats or tortoises around your feet. But numerous plants of suitable size, even when grouped together, provide richness rather than excess. Besides being appealing in themselves, clustered plants can be useful in hiding things that you don’t really want to look at. It might be anything from the blank side of a filing cabinet to the back of a television set, which just needs something lively in front of it. A disused radiator can be planked or boxed over and provide a good home for trailing plants. A damaged wall or wallpaper can be artfully masked; old pipes or fixtures can be concealed. I planked over a bidet once, and this simple platform transformed the bathroom into a haven of flourishing life. Alsobia dianthiflora is a trailing succulent related to the African violet. It has flowers that begin as a tube and end with petals that have tiny multiple spikes like eyelashes. It likes a sunny but not burning-hot position, and while it is not a water-guzzler, the leaves will yellow if it gets dry. A wonderful plant, inside or out. Even without flowers it's a beauty. Finally, it’s hard not to get the sense, seeing plants close by one another, that proximity to their own kind must be good for them. And indeed it is: as we noted earlier, plants that transpire together, thrive together. The extra humidity shared by the plants, as water evaporates from their leaves and perhaps their water trays, won’t be noticeable to you, never mind bothersome. It’s also easier to mist them when they’re in a group, which makes it more likely that you’ll do so. When someone shows you a room for the first time, your eyes do not, of course, sweep mechanically from floor to ceiling and around the length of the walls. Usually, the room gives a general impression—‘airy’ or ‘crowded’, ‘bright’, ‘organized’, ‘jumbled’, and so on. Then, assuming that the person you’re with isn’t hogging all your attention, you focus on particular objects. Like anything else, plants contribute both to the general impression or atmosphere created by a room and to its specific points of interest. They can have a more positive effect, and a more noticeable one, by being arranged on each of roughly three levels: 1) chair level, 2) eye level when standing, 3) above eye-level. These are the heights or levels at which one looks down at plants, straight at plants, or up at plants. Pots that dot the edge of each step in a staircase are attractive because, apart from decorating the staircase, they present a varied view to the eye. Tall plants or trees are obviously excellent for providing interest at Levels 1 and 2, and sometimes 3. Because of their size, they are dramatic; and because they sweep up through levels (or ‘unite’ them), they are restful rather than cluttering. They also fill spaces that just look empty when nothing’s in them, yet on the other hand would simply be chock-a-block if you inserted unnecessary furniture. Plants, by contrast, never look unnecessary—and they’re usually a whole lot cheaper than ornamental furniture. Side-table or coffee-table plants make a seating area more welcoming, since their presence at that height announces: ‘this is where the action is, too.’ The base of a fireplace is also a good location for ‘chair-level’ plants. When one looks up from a book, they’re in view. In the midst of a conversation, they are there for the eyes to rest on. Cup-like flowers are often best displayed at this level because they need to be looked into, from above, to be appreciated. At standing eye-level and above, the usual cabinets or bookcases may be all that’s needed for an effective display, but plants don’t need that much infrastructure. Other possibilities include a drift of ‘floating’ ledges, projecting from the wall at different levels, each with room enough for one plant. A mirror with a built-in shelf, or flat-backed containers that can hang on the wall, are other minimalist alternatives. Many wrought-iron candleholders, whether freestanding or wall-mounted, are large enough to hold several small plants instead. There are also metal and wooden stands designed specifically for elevating containers, often in tiers, along walls or fitted into corners. Pendulous flowers are particularly well placed at standing eye-level or above. I mentioned elsewhere the suitability of bamboo as a screen. Another possibility for a screen, which would be more solid, is a display case constructed of shelving that is open on both front and back. Such a case could hold a mix of plants, books, and decorative objects, or simply hold plants. Trailing, climbing, or upright plants could all have a place on this screen, and the eye would find delight on all levels. Whatever the level, the important thing is that each plant can be seen. If you have a nook within a room (say, a bathroom), a plant that reveals itself only upon entering the nook may be a surprise, and that’s just the way you want it. On the other hand, if you think that the proper thing is to put the plant in the window, or on the toilet cistern, you may be effectively ‘hiding’ the plant. To improve this situation, you may want to transfer it to a hanging basket, so you can put it near a doorway or drape it over the shower-curtain bar. This lets you have a clear view of the plant every time you pass the room, and not just when you happen to be standing in it. The idea is to feature the plants, to have the sense that they are presenting themselves, rather than being tucked away where you have to seek them out. This doesn't mean you don't attempt to place them where they thrive. You merely try to find the optimum spot that serves the plant well while keeping it clearly in view. Apart from anything else, plants that are often seen tend to be better looked-after. This bamboo palm prefers indirect light. This sheltered, tinted window won't over-light it, and the pot will be big enough for the right quantity of soil for the plant. Human beings need sun as much as plants do, albeit for somewhat different reasons. This fact practically guarantees that any home designed for humans will also be acceptable to most indoor plants. But of course, even the most open and well fenestrated home has its dim corridors and shady corners. This leaves the home decorator with two options. One: put your green plants near the light and keep dried grasses or fake plants in the dim spots (along with photos, watercolour paintings, or collectors’ items that really shouldn’t be in the sun). Two: put real green plants in the dim spots, but choose shade-loving plants or at least those that can cope with little sun. If you have a lot of dim areas and you feel they’re in need of jollying up, then I suggest pushing your luck. Many plants that are said to like a medium or filtered light will actually accept low light, though they won’t grow as much nor look so splendid as they might elsewhere. It’s worth putting a Prayer plant there, for instance, or a Club moss, and seeing how it gets on. Certain plants are known, of course, for preferring indirect or even low light. Ferns, such as the dwarf Elkhorn fern, Sword or Boston fern, and the Maidenhair fern, prefer indirect light, and though they like brightness they can manage with less. 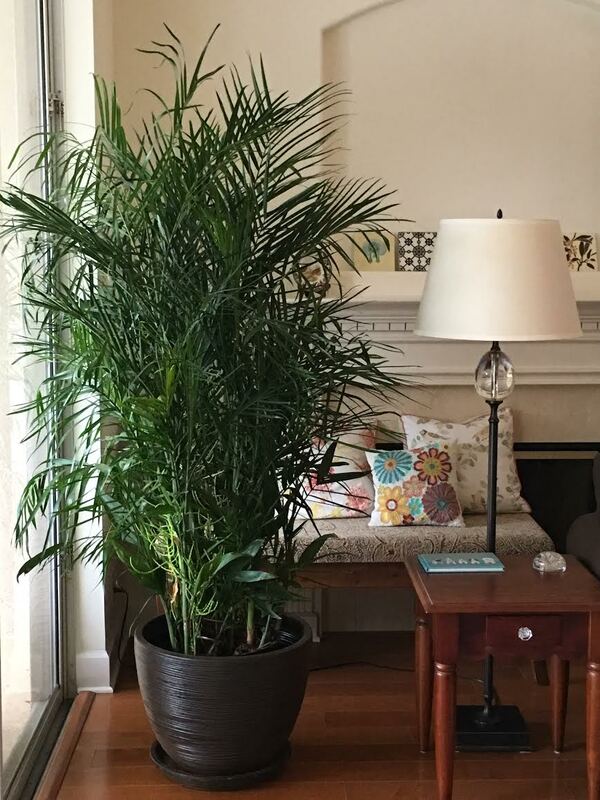 A very good low-light choice is the tabletop or parlor palm. It’s available everywhere and it will stay nice and green when out of the sun. For something a bit more unusual, consider the exotically primitive-looking ZZ plant, which has prominent stalks like arched spines, with foliage set along it an angle, like a partly-open book. (ZZ stands for Zamioculcas zamiifolia, its scientific name; like human beings, it is the only species in its genus). There are also a number of plants, roughly similar in their graceful, broad-leaved, deep green appearance, that can take care of themselves in a dark corner: the Cast Iron plant (Aspidistra elatior); the Peace Lily (Spathiphyllum), which has white bracts and flowers; and the Homalomena varieties. The so-called Elephant Ears—which means anything that is called Elephant Ears, whether it be an Alocasia or a Caladium plant—will tolerate low light very well. There are lots of suitable low-light plants; it’s just a matter of finding them. A great deal is said in books about the need of certain species for humidity. Plant owners are warned against over-watering at any time, and are told that plants need even less water in the winter (winter being the ‘go-slow season’ for most plants). In the winter, however, the water that is not supposed to go into pots is now sought after for filling the air, at least the air immediately around each plant. Furthermore, and regardless of the season, owners are warned that high humidity is ‘absolutely essential’ or ‘vital’ to the health and possibly the life of certain plants. Sensible people would likely be put off from keeping such plants, when they realize that they have neither the ability nor the motivation to provide this crucial near-steamy environment. In addition, especially in humid climates, many homeowners actively combat humidity since they fear inviting mildew. Books that demand what people can’t provide are often doing so sincerely, in the interests of both people and plants. On the other hand, such books can also be inaccurate as well as doctrinaire. Dos and don’ts are the lifeblood of manuals and care labels, but what are you to make of them when, as sometimes happens, they flatly contradict one another? Real life is more experimental and amenable to compromise, as my bird’s nest fern lived to show. It is often said that this fern craves highly humid air as well as moist soil. However, I have grown this plant in bright indirect light, in a living room with ordinary warmth and humidity (or dryness), with no ill effects. In fact, the arrangement worked out beautifully for both of us. Perhaps this fern has different needs at certain stages in its life, and perhaps it could have grown even lovelier in a slightly different location. The point, however, is that most plants are worth a try, even if you are told that you don’t have ideal conditions. Take the plant’s stated need-list with a grain or two of salt. You might end up with a bedraggled plant, but on the other hand, you might surprise everybody. This is not to deny that a plant’s lushness, fullness, and beauty are more assured when it isn’t silently struggling. It is also true that humidity can dip severely during the cold months, when the heating is cranked up and the air seems very dry even to humans. If you are in such an environment, and you wish to coddle your charges, there are a number of reliable ways to give them additional moisture. Candidates for these moisture treatments include palms, mosses, ferns, ivies, Gardenia, and species of the Alocasia genus. Here are several moisture treatments, presented roughly in order of ease of implementation. 1) Put a water tray under the pot. The water poured into the tray evaporates around the plant, compensating somewhat for the dryness of the ambient air. One benefit of a water tray is that, once it’s set up, it ‘runs’ itself—unlike misting. * An even simpler option, if the pot has a watertight bottom, is simply to place the pot directly in a pan and fill the latter with as much water as the height of the sides will allow. * If the plant is fairly small, you can also trap moisture around it by giving it a glass casing. This could be anything from a kitchen bowl to a tall upended jar, resting on the water tray. 2) Fill small containers with water and place them in a circle on the soil around the base of the plant. These can be any small object, such as ramekins, tea-light candleholders, or even egg cups, that will leave enough soil exposed so that you can water it easily. This is a good alternative to a water tray, if there isn’t space for one or you don’t like the look of it. A somewhat large plant will generally have an expanse of potting soil around it on which to place the water-holders, and it may also sit a bit lower in the container than small plants, so that the water-holders need not be visible. 3) Keep your water-greedy plants in the bathroom or shower room. When you have a nice long shower after a hard day at work, not only will you feel refreshed, but your plants will have a moisture boost as well. 4) Mist smooth-leaved plants with a spray bottle. The effect is temporary, so it’s good to do it frequently; a daily mist is ideal for many species. If you don’t want to wet your furniture at the same time, it might be best to put the plants in the bath-tub or on a tiled surface, where you can spray away without inhibition. 5) If you have several plants with similar light requirements, group them together. Even though you may normally want to your plants separate—spreading their cheer throughout the home—it may be that lower winter light presses you to move them from their usual spots anyway. Instead of being spread out, they’ll be grouped by a window. This will bring them the additional benefit of increased humidity, as water evaporates from all the leaves. 6) Put small to mid-sized plants in a glass housing or terrarium. 7) Run a humidifier, though not necessarily a large-tank version. Why not try a portable humidifier, which you move from time to time around your home? Or buy two or three portable humidifiers and place them in separate rooms. These machines are not cumbersome or expensive, and may benefit you as well as the plants. Another cost- efficient idea is to buy an area heater, or combination of heater and cool fan, that also has a humidifying function. In addition to these treatments, you can help soil to retain moisture, and stay put when being watered, by placing objects on its surface. These are usually glass or actual stones, which come in different colours and polishes. Ceramic beads, small shells, even beechnut husks will also do the trick—and besides, they hide the dirt. * Be aware, however, that covering the soil with objects means two things: one, you can’t see the soil any longer, or prod it easily, to check whether it’s wet or dry; and two, less air will come in contact with the soil. This may mean that you end up over-watering, with the result that the plant won’t grow or develop much. Soil covers, particularly impervious ones such as pebbles, are most useful with young or starter plants in very small pots, which may dry out more quickly than you can replenish them. Otherwise it may be safer to keep the soil exposed. If you are away from home—say, for a week or two—then an easy way to keep plants from dehydrating is to cover each one, after watering, with a clear plastic bag. If the plant is small enough for it, a bin liner or supermarket vegetable bag is ideal. Or try using a large oven bag. (Otherwise you may need to tape a few bags together.) There’s no need to secure the bag; as long as it reaches past the container rim, it will act as a mini terrarium. The plants can stay where they are or you can move them temporarily, perhaps giving them more sunlight during your absence. If a plant has nearly succumbed to severe dehydration—perhaps you were away for too long, or simply forgot to water it—you may still be able to give it a new lease of life. First, you could try saturating the roots, which may bring on a revival. If not, snip off whatever healthy remaining stems you find, wet the ends, and dip them in rooting powder. Put these in moist soil, then cover the cuttings with a clear plastic bag to keep the humidity high. Look now and then for new growth; when it’s underway, you may remove the bag. Maranta has prettily flecked leaves -- or should. This specimen wouldn't be happy wherever I put it, so I decided to plant it outdoors as a last resort (see picture above left). Notice the difference in the leaf colour: I made the right choice! Collecting plants that all have solid-coloured foliage can sometimes seem a bit monotonous. The antidote is species whose leaves are ‘variegated’, meaning that they are not a solid colour but have patches, edges, or streaks of white or some other contrasting colour. When the leaves have not two but three colours in their pattern, the third often being pink, the Latin word ‘tricolour’ is appended to their names. For beautifully patterned foliage, one cannot do better than the Calathea varieties on the one hand and Maranta types on the other (they are members of the same family). This Calathea variety looks almost like painted pottery. It has dark green marks on a lighter green, with maroon undersides. The striking Calathea varieties look as though someone, with a deft feathery brushstroke, has painted pictures of leaves on top of actual ones. The foliage generally has a rich jewel-like green glowing on a paler hue, and an attractive maroon underside; some types are glossy and smooth, while others have a somewhat velvety texture. Similarly showy are the Maranta leuconera members, often identified as the Prayer plant. The most colourful member of this group is the Herringbone plant, which has two distinct tones of green traversed by a jagged red vein; the leaf texture is smooth and, like the Calathea, might as well have been painted. In addition to its unusual pattern, the plant has a daily behaviour to add to its charm: in the manner of a butterfly, it lowers its leaves to receive the sun and pulls them upwards at nightfall. This plant does well with medium light exposure, which can even drop into the dim side for some part of the day. It likes humidity, so a bathroom would be ideal, or you can directly mist the leaves. The Alocasia genus provides a different look entirely. It presents many variations on the same theme: a dark, elongated trowel-shaped leaf, deeply cut at the top, with light veins crossing it like creases in a characterful old face. In fact one name for an Alocasia plant is African Mask. A similar version, more familiar to British gardeners especially, is the Kris plant. Elephant’s Ear is a loose term applying to all manner of Alocasia species, as well as to similar plants of the Caladium genus. The Fittonia genus provides plants of yet another, distinct character. They have somewhat wavy, papery leaves, richly and delicately veined throughout. Some are shades of green with white veins; others are crisscrossed with a delightful light pink. They are tolerant plants, but medium or indirect light is probably best. The Dragon Tree must just as well be called the Firecracker Tree, since its foliage looks like a collection of squibs exploding in the air. However, to call it a tree is somewhat misleading since it can be bought as a young plant in a tiny pot, which even when repotted is still ideal for narrow shelves or small tables. The ones called ‘Marginata’ are bicoloured (striped green and yellow), but tricolour versions of pink, white and green are available. The large, treelike dracaenas are good for breaking up the square and rectangular lines that we see in most furniture. They also look wonderful splashing out from behind sofas. As with other tall plants, they fit in places where furniture is unneeded, adding depth and visual interest that would be hard to achieve in any other way. This plant is a good candidate for frequent misting, particularly in the interest of keeping its leaf tips green. Good to know: If the leaves die or become infected with mealy bugs, simply pull them off. Vigorous infected leaves can be wiped down with a wet cloth. Like the Dragon Tree, to which it is related, the Yucca plant or Yucca cane is a floor-standing plant, with a definite ‘look-at-me’ character. It is sold singly or as a grouping of thick round canes (trunks) without branches, each of which are topped with rich green sword-like leaves. There are dozens of yucca varieties, but the indoor choice is the Giant or Spineless Yucca. Good to know: Water well but only as needed, when the soil is distinctly dry. Over-watering is more likely to happen with this plant than with most others. This species bears some resemblance to the yucca, having its thick cane structure and top-heavy look—but the leaves flop down like long dog ears rather than spiking up. The more interesting ‘Massangeana’ variety has broad yellow-and-green striping down the length of the leaves. If you’re lucky, when they’re mature they may come out in mop-head white flowers, ahead of red-orange berries. The corn plant is rather similar to the spider plant in its easygoing requirements: it will live well enough with less light and humidity but if you give it a bit more, it will do that much better. The general rule about watering plants applies here as well: more often in summer, less often in winter. Being a Dracaena species, the corn plant also prefers a warmth location to a cool one. All in all, an easy customer. Good to know: If you want the fragrant flowers for which the plant is scientifically named, gives it lots of light. Also known as the Crow’s Nest fern (for no particular reason), this is an epiphyte in its tropical habitat, which means that it attaches itself to other plants without being parasitic, in order to obtain nutrients from the air. Its smooth, shiny leaves are bright green, unfurling from a central point like flower petals. It is very tropical both in look and in needs: a moist but airy soil is good for it (as opposed to a clay-like indoor/outdoor soil). Genus: Asplenium. There are a handful of species, of which Asplenium nidus is most common. Good to know: This plant is a good candidate for direct planting in a container, since watering from above suits it well: its leaves are designed to serve as a funnel for rainwater in its natural habitat, so they are happy to get wet. This non-palm relation of the yucca cane needs direct light and a dry atmosphere -- so it's not a natural candidate for the bathroom. The name is in all senses fanciful yet at the same time evocative of how the plant looks. So is the alternative name of Elephant’s Foot, which refers to the swollen, corrugated base of the trunk, which is essentially a water storage tank. The plant is usually sold at a height of one or two feet but can grow to be several feet high indoors. Established plants are more impressive than juvenile ones yet retain the ponytail look, while very mature outdoor plants develop several branches and the swollen trunk becomes wider and more prominent. This plant wants bright sun and, like other succulents, a soil that’s allowed to dry between waterings. It then wants a good watering, which will mimic somewhat the drought-downpour cycle of its arid native Mexican habitat. A sandy soil or one with good drainage is helpful. Good to know: If you see the name Nolina recurvata, you’ve got the same plant: this is a case where botanists changed their minds a couple of times, first classing this plant as Beaucarnea, then as Nolina; now there are some that assign it as Nolina, and others for whom it remains Beaucarnea. It would be a mistake to think that tall or expansive plants are too much trouble—literally too much of a handful—to bother with. For a start, the same steps must be taken with all plants, whatever their size; the only difference is the weight of the objects you handle. Furthermore, all plants start out little, and if you don’t want to bring home a large and mature specimen, you are free to find one that’s younger and more petite. Most owners of substantial houseplants didn’t buy their stock at its current size. Just as outdoor gardens take time to become mature-looking and established, so also do many indoor ‘gardens’. If, on the other hand, your attitude is ‘I need height and splash and I need it now’, then by all means select the biggest, most luxuriant specimen. Get a friend to help you, if need be. Bamboos are grasses — surely the only grasses in the world that chime together enchantingly in the wind. Many species are well suited to growing indoors, where they will be as big or as small as you want them to be. If you limit the pot size, you limit the plant. So bamboo can be treated as a reasonably compact decorative grass; or it can be allowed a horizontal spread and considerable height (between, for instance, five and seven feet), functioning as a living screen. A screen of this sort may be highly desirable in a home with an open plan. Let’s say you have a seating area that leads—directly as the eye sees—into the kitchen, dining room, or entrance hallway. The spaciousness of this set-up may be nice, but you may also feel that the seating area lacks a sense of cosiness or seclusion. It’s not a distinct nook with its own atmosphere, since it’s always a part of adjoining atmospheres. Bamboo and other tall plants can provide the needed antidote in just the right measure. A green, airy screen, rooted in a wide planter or pair of planters, will provide a sense of distinctness to a space, whatever it is used for, without walling off the space that lies beyond. Genus: Various genera; Phyllostachys species are common. Good to know: This is a type of plant that benefits from occasional pruning. Don’t be afraid to take off leaves that are looking scruffy or dead, and feel free to cut back the culms (bamboo stems). This way you can keep them a handsome shape while controlling height and promoting new leaves and shoots. A handful of unrelated plants have the common name of Umbrella Plant, but we are interested in the Schefflera varieties: Schefflera actinophylla (the ‘tree’ version), and Schefflera arboricola (the ‘dwarf’ version). The leaves are many-lobed or ‘palmate’—think of fingers outstretched from tiny wrists. The plant is also a strongly vertical grower, and can outstrip the people that care for it. Though clearly very different from a spider plant, it shares several of the latter’s appealing attributes. Like the spider, Schefflera has abundant, often variegated foliage; is a good air purifier; is easy to multiply; and its motto is ‘I thrive.’ There are completely green Schefflera varieties, but the ones with some yellow lobes mixed in with the green look sun-splashed and thus very attractive. They also give the eye something extra to catch hold of. To get a new plant, all you have to do is cut off a branch and stick it in a new pot with fresh potting soil: rooting powder isn’t even necessary. Treat them as you would any other plant from then on, and they’ll be fine. Their height makes them good for screening, for instance at a window (that’s not extremely sunny) where you don’t want a curtain but also don’t want the neighbours looking in. Good to know: Prune (cut shoots or branches above leaves) to encourage bushy branching. Otherwise the plant will be stalky, its energies given to growing up rather than growing all round. The stems are not particularly stiff and you may need to stake them to keep them upright. As the name says, this palm in its petite phase is perfect for a tabletop, though it can also be a floor plant. It is elegant and refined rather than showy; which justifies another of its common names, Parlour palm. A healthy one will grow new fronds but an overall increase in size is slow and limited. Direct high light will make the fronds pale and strong sun will scorch them. Indirect bright light or medium light is better, but this plant does very well also in low light or partial shade. This high tolerance means that there is always a place somewhere in the home for at least one table palm. In fact, a more easygoing plant is hard to find. Genus, species, variety: Chamaedorea elegans ‘Bella’. Often referred to as Neanthe ‘Bella’. Good to know: This palm is potted as a collection of separate stems (which makes for easy propagation by division). If a stem or frond dies, cut it away instead of trying to pull it — otherwise you’ll pull out the soil rather than the frond. The Balfour can look like a miniature tree, with an upright green, grey-pipped stem and a parasol of smooth green, scalloped leaves. Call it the Mary Poppins of the houseplant world. Even at a height of six or seven inches, it is so distinguished that it ought to be specially featured: it is not a plant for being crowded and partially obscured in a mixed grouping. There are two similar versions: ‘Marginata’ has irregular white edges or margins, while Pennock Aralia or ‘pennockii’ has attractive creamy splotches. It doesn’t need a very sunny location, but bright filtered or indirect light is beneficial. People often look forward to having mature plants and especially mature trees, since time allows the plant to grow into its full beauty. The so-called False or Spider Aralia is one of those few species that may be preferred when young, owing to its unusual development. As an immature, its narrow serrated leaves, with the texture of smooth leather, are deep green, and have a brown median vein. They spring out on slender branches, from stem base to tip, creating a refined bushy effect. The mature plant, by contrast, develops broader, much longer and darker leaves that are less tidy and even more leathery. You may like the sort of tangled, long-haired stage of this Aralia, but you are not obliged to grow it until that stage. You may prefer to keep it small in a close pot or terrarium, or at a certain time, get a new one. Recommended is the handsome ‘Galaxy’ variety, whose leaves have just enough pale edging to give them extra definition and interest, as well as tidy, finger-like foliage. This Aralia is usually sold as a group of plants, so propagating by division is easy. Otherwise, take cuttings. Genus and species: Dizygotheca elegantissima. The name of this plant varies, as with the Balfour Aralia. Good to know: Aralias are said to like warmth and humidity, but they encamp quite happily in ordinary home conditions. If you think that a moss can be tidy but not elegant, consider the club or spike moss, whose nickname in some circles is ‘posh moss’. Yes sir and madam, this is not just any old moss. In fact, it’s not a moss at all, being related to ferns. However, it is a genus of low-growing, delicate-leaved plants, which often resemble little paws reaching out to the light. Colours vary: some are a rich green, others have golden highlights; others are called ‘rainbow’ and look almost iridescent. It’s rather fun because it’s not your average houseplant. They are, however, humidity cravers. If you don’t want to keep yours by the shower, then consider using a water tray; or safer yet, put it under glass, whether under a simple bell or in a terrarium. That will give it greater warmth as well as humidity. As for misting, the only pitfall with misting directly is that large water droplets bog down the leaves, which leads to rapid deterioration. The finer spray of a plant mister, as opposed to an ordinary spray bottle, is much better. You might find it worthwhile to add some sand or gravel to the potting mix, to help with drainage: club moss likes moisture but sogginess is deadly. Good to know: This plant can accept fairly dim light; in any case it should not be placed in the direct path of sun. We all know cacti when we see them: they are the interesting green things with a stay-where-you-are look, their spines and points never asking to be handled. More objectively, they are a type of succulent or water-retaining plants, but unlike the group called ‘succulents’, they have very specific requirements. By and large, the best way to love a cactus is to leave it alone in the sun. In winter it wants just enough water to keep it characteristically fleshy; in the warm months it wants a bit more, since this is when it does the job of growing. It doesn’t want you to lavish it with large pots full of rich soil. Instead, it wants the opposite: small containers without much elbow room, and a sandy soil, perhaps one with flecks of foam in it to help with drainage. Or simply use specially prepared cactus mix. A cactus when you buy it may be flowering, and depending on the species it may flower again next year—but there are no guarantees. As with some other types of plants, flowering is more easily achieved outdoors than in. Succulents, such as Aloe vera, the jade plant, and Kalanchoё varieties, are much more varied in form, yet more average in their needs than are cacti. As a group they often have thick, well-defined leaves, which may be squishy-looking but won’t bend easily and which sometimes look no friendlier than cacti. But many succulents don’t fit this description at all. Appearances can be deceiving: the Ponytail palm looks more like a palm than a succulent, yet it belongs to the same family as the Blue agave (Agave tequilana), the basis of tequila. Regardless of form, however, succulents love sun and somewhat infrequent watering, as well as a warm location. Many succulents can be propagated with a single leaf. Put in a soil with added sand or grit, then cover with a clear bag or jar to retain humidity and encourage new growth. Do the same thing with a cactus offshoot but water it less and omit the covering. Good to know: Despite being hot-climate and often desert plants, all succulents including cacti can thrive in the same sort of bright location you’d choose for, say, a spider plant. Flamboyant and frothy: Maidenhair fern, Dwarf Elkhorn fern, Dieffenbachia, Heavenly Bamboo, Spider plants, Norfolk Island pine, Fiddle Leaf fig. There are several varieties of ‘Maidenhair fern’; one that is distinctly favoured for indoor growing is Adiantum raddianum (sometimes called the Delta Maidenhair fern). The Maidenhair’s fronds have the outline of a grape cluster, and its leaf is bright green and finely scalloped, with a slightly serrated edge that suggests a furry paw. The flat leaf surface, however, is smooth, as are the numerous black hair-like stems (‘stipes’) from which the leaves fan out. The stipes waft its numerous fronds over each other, in a manner different from that of other ferns, which tend either to radiate upwards or to cascade heavily as if water were flowing over them. Good to know: The Maidenhair tends to prefer indirect or filtered light. As with other ferns and papery-leaved plants, it ought to be kept moist. The dwarf Elkhorn fern has an upright, vivacious habit and slightly waxy, frilled leaves, vaguely suggestive of antlers. It is not common, but worth looking out for because it’s so attractive, and is not a difficult plant to keep. Just remember that a classified ad for this plant would say: likes moisture, is shy around the sun. The fern should be kept moist but not wet. You can afford to let it dry out a little between drinks, but the key word is a little. It’s best to err on the side of watering—otherwise its bright green leaves will start to wither and darken at the edges. Fortunately, the shape of the leaves is such that, if withering occurs, you can remove the affected bits without making the plant look as though a dog chewed it. A humidity treatment is a good idea, especially as an antidote to dry winter air. A range of light is acceptable except for very low light on the one hand or more than an hour or two of direct sun on the other. Avoid strong or full sun for this fern. It is often said to like shade, unambiguously; but that really applies to landscape use, outdoors in a hot climate. As an indoor plant, it will tolerate medium to low light but would appreciate a brighter spot even more. As with other plants, dosing it with an all-purpose food now and then can be helpful. Good to know: Can be difficult to keep alive outside of a Wardian case or terrarium. A colourful varied genus of tropical plant that likes moist air, so get your mister out! These striking plants are green-edged with various lighter shades splashed in the leaf's center. Bright light for much of the day is generally best, but you can experiment with different distances from the window. Will wilt when thirsty, but a normal drink will make it spring back to life -- just act quickly. Good to know: Treat with caution and keep away from pets! Propagation of Dieffenbachia is easy (by taking cuttings and then planting with rooting powder on the cut stems) -- but wear rubber gloves and protect your eyes, as the plant is reputedly extremely irritating to membranes, skin, etc. The common name of this bushy plant is Heavenly Bamboo, but since the ‘bamboo’ part is a misnomer, many people prefer to call it Nandina. Despite its small pennant-like leaves, the Nandina is not related to the bamboos; nor does it have their habit of ‘running’, or spreading rapidly when uncontained. Nandinas are usually landscape plants but fortunately they can be grown indoors as well. There is an embossed, lop-leafed version of Nandina and an upturned, stiff-leaved version, which is perhaps more exotic-looking as well as more common. The foliage colours are shades of green, mixed in and topped with sunset tones, including a deep red. There are usually white flowers as well as white, green, or bright red berries. There is a lot going on with this enchanting shrub, which well deserves pride of place. The dwarf versions may be especially suitable for homes because of their smaller size (between one and two feet in height), but they may lack berries and flowers. A reddish-purple variety is Nandina domestica nana purpurea; ‘nana’ is the word that indicates ‘dwarf’. Good to know: They are not very fussy but do like bright sun, which heightens their colouring, as long as there’s no danger of scorching. It’s not fair, really: spider plants can’t have the charm of the new discovery, nor the special interest of something that’s rare. We all know what they look like, we’ve all seen them before. Yet spider plants remain popular, despite the competition from an ever-growing menu of exotic plants. There are many reasons for their enduring appeal. First and most important, they are very cheerful, jolly-looking plants. This is because they produce abundant leaves and plantlets which all seem to have a bounciness to them, as well as a vibrant, streaky green-and-white colouring. Second, they are incredibly forgiving, accepting all sorts of conditions and hanging on through one’s neglectful moments or accidents, to come roaring back another day. Spider plants can achieve an impressive height from the rim of the container, but they also have a cascading quality. Not only is this attractive in itself, but it also de-emphasizes the container. If I have a pot of which I am not particularly fond, that will often be my choice for a spider plant. Spider plants come in two varieties: the standard, gently curving variety; and a curly-leaved variety, the Bonnie hybrid. If you feel that spider plants are ho-hum, you may wish to give the exuberant curly one a try. Spider plantlets spring forth from a well-rooted parent plant, but you are under no obligation to keep these in place. If you would rather not have the plantlets and their yellowish stems, then you can snip them off and it will do no harm to the plant. In fact, the energy that went into the plantlets will now revert to the parent, promoting desirable bushy growth. Good to know: Buy one spider plant, get all the others free! This plant is a particularly effective toxin-absorber. This tree is more like a fir tree than a typical pine, having feathery branches of soft needles with a somewhat spongy feel. The branches are not densely packed together, but rise above one another in tiers. This means that, although it can grow to be several feet tall, it’s not overpowering and doesn’t block out everything behind it. Being an airy tree, it can stand near a window and still let other things benefit from the light. Good to know: This plant does not respond well to pruning, which permanently blocks growth at the point of cutting, rather than encouraging bushiness. The best thing is to leave it alone and restrict pruning to any dead bits or branches that you feel are too low on the trunk. Between generous waterings, let the soil dry a bit—but not very much, it’s not a succulent or cactus. Like its cousin the Weeping fig, it will tend to drop leaves if relocated or if the water amount doesn’t suit it. Otherwise, it is very indulgent of the home habitat through all seasons, and will carry on growing, slowly but steadily. Its natural shapeliness removes the need for pruning, but if it gets too tall you can prunethe top. Eventually it becomes a tree over five feet high, but unlike some other plants it remains just as attractive. Good to know: Medium to bright light is good, but don’t put in partial shade or full sun. You may have a room — say, a small room without deep shelves or suitable tabletops — where the options for arranging plants are pretty minimal. Perhaps the only spot where they can really go is on your bedside table, or else on a dinky wall shelf or bookshelf that just catches the best light of the day. You don’t want a large plant in this room, because you’d trip over it every time you walked in the door. So you make the most of what you have, and find the beauties that are small. You put them in a small pot and perch them where you can. The impact will be the impact of delicacy and intricacy rather than of showy display. One stand-out contender for your room is the rosary vine (Ceropegia woodii), also known as String of Hearts, which is exactly what it looks like. This is a trailing plant par excellence, since it can dangle for upwards of five feet if not trimmed. Because of the striking, heart-shaped leaves, which are slightly succulent or water-retaining, and its chain-like structure, you do not need a great quantity in order to decorate a small shelf or window. In fact, it will grow in the tiniest of pots. If you want more of them, you can plant the tiny ‘rosary beads’ — actually tubers — that can be picked from the vine. If the plant gets too long for your liking, it’s an easy matter to snip a certain amount off the length and then stick the cut ends into the same pot or a new one. As long as the cut ends are pushed securely in the soil, they will stick and you will have additional threads of the vine. Good to know: The threads of this vine will hang straight down like Rapunzel’s hair if you take care not to entangle them; on the other hand, you might like a caught-up look. Then your plant really will justify the alternate name of Hearts Entangled. This group of African species features delicate colouring, thin shapely leaves, and an upturned, cheerful habit. Likes plenty of indirect sunlight or leaves will yellow. Prefers to be moist but well-drained as otherwise the roots will rot. Water well and allow to dry out between waterings. Misting for extra humidity is helpful. Keep warm: don't position it by a cold draughty door or window. Genus and species: Syngonium podophyllum, also wrongly called Nephthytis (they have for over a century been identified as separate genera, though they look similar). Good to know: Contains oxalic acid (as does rhubarb and spinach, by the way), which can be a skin irritant. Toxic to pets, so keep out of reach. Another plant that is dainty and good for small spaces is Baby Tears (or Baby’s Tears), which seems to have as many alternate names as it has tiny leaves: Mind Your Own Business is one, along with Mother of Thousands (a name it shares with numerous unrelated plants). The latter name makes much more sense that the former, since this creeper, if allowed to grow at will outside, spreads out like a mat and often goes where it’s not wanted. This is the case with many plants in the outdoors, but that’s one of the benefits of growing them indoors: you control how much, and where. In a pot, the baby tears have a frothy appearance and provide a splash of medium green, though there are also gold-green and frosty green varieties. Being dense and eager to roam, this plant will also conform quite well to a contour if you have a shape that you would like it to grow around. There are other possibilities for your small room. One, of course, is to hang a plant from the ceiling, most likely in a corner where it won’t get in the way. But some people feel that hanging plants tend to crowd small rooms. If you share this view, perhaps the better option is simply to buy small or miniature versions of most of the plants mentioned elsewhere in this chapter. Take one spider or ivy plantlet and give it a cosy pot; buy a starter dracaena tricolour; grow a few wisps of Creeping fig, and so on. The rules of care are by and large the same. You’re just plant-keeping on a smaller scale. Good to know: This plant likes shade. There are many ferns that look typically fern-like, and they are fully desirable for doing so. But like the Maidenhair fern and Bird’s Nest fern, the Button ferns offer something a bit different. They are instantly recognizable, and look good at any size. The leaves are disks that dot each side of the stems in an alternating pattern, and the stems spring outward from the plant’s centre. The ‘classic’ Button fern is a dark green and its leaves are glossy and leathery; while the Lemon Button fern is bright green and resembles fish-scales along a spine. Good to know: They are not particularly thirsty species, and they will accept most lighting situations short of shade and full sun. It’s amazing that simple beings, without a brain, could have evolved their leaves in such a way as to turn them into effective weapons and a mouth! There are numerous carnivorous plants, but the species that are most readily available and apt to thrive indoors are probably the pitchers (Sarracenia and Nepenthes species) and Venus’s Flytrap. These plants are both carnivorous, though in the home they will simply be insectivorous. They have different ways of ensnaring their prey, though they both rely partly on scent (which only the insects will detect) and on the action of acidic juices. In each case, the movement of a fly, mosquito, or other insect stimulates the catching and digesting process. This includes any insects that happen to be buzzing around your home, too: they will not be exempt! The pitcher plant’s pouch with upraised hood is the vegetal equivalent of a trap door with a dungeon beneath it. You can get in, but you can’t get out! Its means of entrapment —nerve-acting toxic nectar, come-hither colourful markings, slippery slopes, foot-binding wax — may be rather more involved than that of the Venus’s fly trap. Unlike the fly trap, pitchers don’t even move! But the fly trap’s clamping grip, like two long-lashed eyelids batting together, is also highly evolved and just as mysteriously ‘clever’. Each specimen has several green traps, which die and blacken while being replaced by new ones; they are the fly trap’s expendable parts. The individual pitchers of a Pitcher plant also die but are rather more durable. Every species has its own particular ideal conditions and needs, which should be ascertained at the time of buying. Here, however, is a guideline. First and foremost, use rainwater or distilled water: these plants cannot ‘stomach’ tap water. (If you only have tap water, boil it and let it sit before using.) Carnies require a moist, but not wet, acid soil (ask at the garden centre), mixed with some sand. Watering should be reduced in the winter to lessen the risk of plant-killing fungus. They like a range of very sunny conditions and generally ought to be near a window, but it’s possible to scorch them, so apply Rule #1. You need to keep the humidity high, too. An excellent home for them might be a ventilated terrarium (it’s no good if flies can’t get in, and aeration of soil is important). They are highly tolerant of temperature extremes, which is more than can be said for most plants. Venus’s traps should probably not be interfered with, since they have a delicate trigger mechanism which might fail if forced, and insects won’t be digested unless the plant senses resistance. So an insect simply popped into the trap will likely just rot, and so will the trap. Even if you manage to simulate a live insect’s struggling, it’s possible to overfeed the plant. Certain Pitcher plants’ pouches can be given a little rainwater if they are drying up; otherwise insects won’t drown in them! Genera: - Sarracenia species. ‘New World’, upright pitchers, native to the Americas. - Nepenthes species. ‘Old World’, pendant pitchers. Good to know: Removing dead traps and pitchers makes the plants more sightly and is better for their health. Probably the best and most readily available hanging or trailing plants are various species of ivy, as well as Creeping fig and philodendrons (though some philodendrons don’t attach themselves in the manner of true climbing vines, since they don’t have aerial rootlets to latch on with). Unlike the rosary vine, these plants will grow upwards just as well as they grow down, depending on how you train them to go. Consider, for instance, a hanging container in a room with a relatively low ceiling. The pot or basket is one you like the look of, so there’s no especial need to mask it with descending foliage. The corner it’s in, however, may be rather bare or uninteresting—plainly painted and without pictures, for instance. In that case, you can draw the stems up on to the chain or rope (or thread them, if need be) so that the plant will extend upwards instead of downwards. This will make the whole corner more interesting: it emphasizes the plant, reveals the nice basket beneath, and hides the less attractive chains all at the same time. A trailing plant in a tabletop pot can be given a small trellis, usually a plastic grid, on which to spread upwards. Another way to achieve uplift is to prop up the stems with any stiff object you can find—anything from a bent-over wooden skewer to a miniature whisk, inserted upside down. All of these plants like to be kept fairly moist. Ivy and Creeping fig especially must be regularly watered, since leaf dry-up can be sudden and irreversible. Unlike succulents, with their fleshy water-retaining leaves, these vines tend to lose moisture quickly. The ‘real’ ivy species belong to the genus Hedera. These include the Japanese, Nepalese, Algerian, Persian, and Russian ivy, as well as the Irish ivy (Hedera hibernica) and common or English ivy (Hedera helix varieties). This group is more diverse and interesting than you might think, encompassing a number of quite different leaf-shapes, patterns, and colours, including one beautiful sun-loving variety that is a solid, creamy yellow. Though not Hedera species, many similar plants are also called ‘ivy’ and are good choices where an ivy-like plant is wanted. These include German ivy, Swedish ivy (a. k. a Creeping Charlie), and Grape and Kangaroo ivy (which are related). They are all vines with vaguely heart-shaped leaves, dense growth, and a taste for creeping, whether up or down. Good to know: Most ivies (the true and the impostors) are tolerant, go-anywhere plants and they like water, but let them dry a little between drinks. As with ivy, there are several types of philodendron but the most popular ones for indoors conform to two familiar patterns. The ‘heart-leaf’ type has elongated, heart-shaped leaves, tapering to a fine point (that fine threadlike point is an indication that this philodendron comes from rainy terrain: the tapered tip helps the leaf shed rainwater). This has a number of common names but they all seem to contain the word ‘philodendron’. Then we have the ‘split-leaf’ type, which appears to be artistically sculpted with a jigsaw and scissors, the leaf being cut into symmetrical flaps. Examples of the ‘split-leaf’ type are the Split-Leaf or Cut-Leaf Philodendron and the Swiss Cheese Plant. Good to know: These plants tend to be long-lived. Unlike some other plants, whose flowering and winter dormancy can make them seem temperamental, philodendrons are steady performers, always showing up no matter what the weather. This roving plant has small fan-like leaves with a seersucker texture, and its tenacity makes it useful for ‘cheat’s topiary’. The variegated version is particularly attractive, being widely edged with crisp white or off-white. There’s a place for this species in any room with a window, by itself or tucked in a terrarium or rooted in the soil of larger plants. Good to know: This is a temperature-hardy plant that is quite tolerant of cold. This hanging plant has several common names, including String of Pearls and String of Peas. The last one is perhaps the most descriptive, and this is a fun alternative to ivy in a basket. If you have the heat turned up all winter it may be perfectly fine, but may be just a bit less enthusiastic in its spring gift of blobby little white-and-pink flowers. They look like miniature satellites, making an over-the-top natural ‘necklace’. But the flowers aren’t this plant’s main attraction, anyway. Good to know: A good helping of added sand—say, a third of the potting mix—will benefit this species greatly. Like some other trailing species, the Goldfish plant grows straight up while young, and then begins to trail as its stems grow longer. There are several varieties, and flowers come in a number of hues, including the orange-gold one might expect. The flower shape does indeed resemble that of goldfish, though one particular variety suggests a puffer fish in full puff. The fleshy leaves of this gold-flowered variety are extremely glossy and dark, and their often-visible undersides are a shiny sort of mauve, as if applied with a rather nice lipstick. (In fact, a related genus is actually called the Lipstick plant, on account of its red-and-purple flowers.) New flowers arise from reddish sepals, and the flowers themselves are held outwards, as if they are about to swim away. The whole thing is most attractive. In nature this long-flowering plant is an epiphyte, which means that it is not rooted in soil. However, your plant will come potted in some sort of compost so that will be the basic growing medium for the plant. Whatever matter you add to it in repotting, make sure it’s light and fluffy, not a heavy soil. Bright indirect light and humidity are the friends of this plant, but it will be quite tolerant in anything other than full sun and it doesn’t want frequent or deep watering. Consider this a ‘vicarious’ plant, or one that likes to get its goodies almost second-hand. With some plants the danger is in not providing enough for them. With this plant, especially in a warm home, the danger is in overdoing it. Genus: Columnea rubra; also, Columnea x banksii (which means ‘a hybrid species called ‘banksii’ within the Columnea genus’). Good to know: Misting is a good idea in dry seasons, especially if you are keeping a light hand with your direct watering. If you have a hairy-leaved Columnea, don’t mist, but give it a different humidity treatment instead. Within the realm of vegetation, there is what we might call an ascending ladder of difficulty in producing the features that we find so engaging. That is to say, any old plant can produce foliage of some sort. That’s the vegetal equivalent of a karate white-belt or beginner’s level. A plant might go on to produce, occasionally, a few small inconspicuous flowers (as on a spider plant), but that only makes it a yellow-belt. To produce showy flowers or fruits is much more ambitious: call that the blue-belt level. But to keep those flowers and fruits coming, time after time and season after season, that’s at least a brown-belt effort — often as much for the human grower as for the plant! Many people simply do not have the time or circumstances needed to get an orchid, for example, to bloom for a second time around. It’s not a casual undertaking, given that there are societies the world over devoted to the complexities of just such an attempt. Orchids are typically sold, at least to non-enthusiasts, complete with their beautiful flowers: otherwise, they would simply disappoint. But other, less rarefied and less expensive plants are also difficult to coax into bloom. The Gardenia is a somewhat dense, deep green shrub that produces highly fragrant blooms. Manufacturing these blooms, however, is not like falling off a log to the Gardenia. This is why, when you buy a gardenia that is not actually flowering, you often find cut-out photos of its flowers clamped on to its branches. They are there to show you the lovely rose-like white blooms that you would be having if only the plant would oblige you and produce them. But it hasn’t produced them, and, unless you can arrange for specific temperatures day and night (within a moderately cool range), there’s a strong likelihood that it won’t do so. That’s why the grower has taken pity — or sucked you in — with the photographic substitutes. Does this mean that Gardenias are a waste of money? Not at all. What it does mean is that if your heart is set on seeing and smelling the actual flowers, then you are well advised to make sure that the plant is in flower when you buy it. (Not even just in bud, since the buds may or may not open. Often, they simply fall off.) But blooms aren’t everything. The Gardenia is a rather arresting plant, notwithstanding its lack of startling colour or unusual leaf pattern, and is worth having even without its flowers. That’s a genuine compliment: some plants, stripped of flowers or bracts and with only their foliage to clothe them, look like Cinderella before the advent of the glass slippers and designer ball gown. The Gardenia can hold its head up even when it’s au naturel. This plant can, however, be a bit of a sensitive soul. It doesn’t do well with dry air and soil, and likes a bright morning light but not a strong afternoon one. To promote blooming, and to keep the foliage healthy as well, use a moisture treatment such as misting. Otherwise you may find that some leaves will darken and curl, and that even green leaves easily drop off. An ‘acid’ feed or fertilizer is also a good idea — or better yet, ask at the garden centre for an ‘acid’ potting soil. If you have hard water (lime), then you may find it necessary to use rain or bottled water instead of tap water. Sensitive soul or prima donna? Genus and species: The most common species is Gardenia augusta or G. jasminoides, which has a number of cultivated varieties (‘cultivars’). This genus bears the fortunate name of Dr. Garden, an 18th-century botanist. No kidding. Good to know: A conservatory or unheated sunroom is ideal, provided that it doesn’t get very hot or shade-less in the daytime. Lilies are not quite in this ‘when you don’t have it, flaunt it’ category. Certainly the leaves, which are either bright green or dark green blades ascending the stem, are part of the charm. It’s just that varieties of the genus Lilium, to be fully worthwhile, really are best with their large, flowers. These mostly have the shape of a peeled banana, minus the banana. For a week or two they will erupt in glorious banana-peels, one after the other. Then it’s over, leaving you with the greenery and a bulb beneath the soil, which you can either keep in a moist cold storage or throw away. Genus: Lilium. The Daylily and Peace Lily are not in the Lilium genus, nor even in the same family (Liliaceae). Good to know: Lilies can be identified in part by their six petals and six stamens. To be on the safe side, these plants ought to be bought when in fruit if that’s the view of them you really want. And try to obtain them at the beginning rather than the end of their fruiting seasons: spring and summer for the Pincushion; autumn and winter for the Jerusalem cherry. Getting them to repeat the trick may be more than you want to be troubled with, since they need to be put outdoors for part of the year if berries are to grow in the next cycle. If you see these plants in flower, that’s a good time to buy, since the flowers precede the fruit. The New Zealand pincushion or bead plant is more reliably known by its scientific name, Nertera granadensis. It is a delicate creeper that looks like a midget Baby Tears studded with berries—originally bright orange, now also sometimes white or yellow. These round fruits are smaller than the somewhat similar fruit of the Jerusalem cherry, more reliably identified as Solanum pseudocapsicum. ‘Jerusalem cherry’ is a fanciful name, since the plant is native to South America and cherries have nothing to do with it. Both its fruit and its leaves remind one of a young tomato plant, and in fact they belong within the same genus. (In turn, the tomato, potato, and aubergine (eggplant) varieties all belong to the same plant family.) The crucial difference is that in a tomato plant, all the parts except the berries are poisonous; in the Jerusalem cherry, the fruit is toxic as well. By contrast, the Pincushion berries are edible raw. The so-called False Jerusalem cherry is a different species of the same genus (i.e. Solanum), with a remarkable similarity to the ‘genuine’ article. The main difference is that both the stems and the berries are smaller (and the berries paler) than those of the Jerusalem cherry. Good to know: The Solanum fruiting cycle can be extended if you shake the plant a little to release its pollen, thus allowing the plant to fertilize itself and form new berries. Good to know: As with all roses, snap off or deadhead the flowers once they have ‘gone over’. This will make the plant look prettier and it will help keep new blossoms coming. The begonia family is more like a vast tribe, its members often bearing little or no resemblance to one another. There are two types of representatives that are particularly valued for their blooms: the large-flowered ones, which are generally grown from tubers, and the small-flowered ones, ‘wax begonias’. The large-flowered ones have a wider range of colours than do the wax ones, and they look like imitations of unrelated flowers: carnations, roses, or camellias. The wax begonia is also called ‘semperflorens’ meaning ‘ever-flowering’, and this is an apt description. It produces small but profuse flowers in white and various shades of red and pink, with bright yellow stamens in the center. The petals have a shimmer, as if candied. The leaves, which are shiny and rounded, come in bright green as well as other shades, which adds variety when you group these plants together. Flowering tends to be continuous and long-lasting, well after other plants have given out. he only drawback with the wax ones is that, wilting and falling on the plant and the surface below, they are somewhat untidy. But this only becomes distracting if you are keeping more than a few. Begonias are not very needy, and tolerate various lighting conditions. They are not shade plants, however; nor can they take the full brunt of the sun. Genus: Begonia. Some begonias, such as B. rex, are grown for their leaves rather than their flowers. Good to know: Wax begonias are toxic, while hybrid tuberous begonias are not (in fact, they are edible—but don’t eat if you don’t know for sure!). If African violets seem unexciting, despite their deeply coloured, gold stamen-studded flowers set within a soft bowl of flared leaves, then perhaps you need a variation to try, rather than a complete change. Though also members of the same family, the Sinningia cultivars offer a splashy alternative to their East African cousins. The frilly, bell-shaped flowers have a broad range of colours and patterns, and are fewer than those of the African violet, but are much larger relative to the size of the plant. Genus and species: 1) Sinningia speciosa. It is still often called Gloxinia, which was the scientific name until scientists changed their minds about the taxonomy; this is why you will sometimes see ‘Gloxinia’ in parentheses after ‘Sinningia’. 2) The African violet genus is Saintpaulia, with many species. Good to know: Water the soil and avoid the leaves, or else water from below. Like other plants with hairy leaves, Sinningias and African violets don’t like to get wet. Besides daffodils and tulips, many flowering plants — cyclamen, Amaryllis, iris, hyacinth — erupt from bulbs. Hobbyists go through several steps, at different times of the year, to prepare bulbs for flowering. Fortunately, the busy plant lover with other preoccupations — perhaps this describes you — doesn’t have to do this. There is a child’s-play way to get the benefits of bulbs. But first, let’s define what a bulb is. Bulbs are similar to rhizomes (the base of ginger and bamboo) and tubers (the base of tuberous begonias and potato plants). All of these are types of underground stem: they store food in dormant periods and then, when conditions are right, sends out roots below and green parts above the soil. Like seeds, they contain the future plant; unlike seeds, they don’t disappear but can be dug up and moved about. They can often keep going, year after year. And they can enlarge themselves, producing junior bulbs known as ‘offsets’, which can be cut from the original bulb and planted somewhere else. This is why flowering bulbs can be bought in simple kits. The kit usually contains an attractive planter, often ceramic; a potting mix; and one or more bulbs. Some bulbs are pre-planted, and it’s necessary to wait for at least a month after watering before any greenery starts to sprout. Other kits are virtually instant: you dissolve the compressed disks of soil in warm water, place the already-sprouting bulbs within, and keep the soil moist as the roots develop and the shoots come up. The container may look too small for the bulbs and the growing medium may look too low and stingy — but don’t worry, bulbs don’t want much room and they like to keep their heads above water, as it were. When the bulbs are still rooting and sending up shoots, you provide scant water but a good amount of light. hen, when the flowers are coming out, you reverse the formula: moderately frequent watering, and rather less exposure to sun. If you can find a cool or even chilly location for them, so much the better — it will keep the blooms fresh for a longer time. Genus: Various genera. Good to know: When moistening the soil, drizzle water around the bulb but not over it, to discourage rot and the growth of fungus. This tree is a shiny-leaved classic. Beloved the world over, the Ficus benjamina is one of those few plants that are perhaps better known by their Latin name than by their common one, which in this case is Weeping fig or Benjamin fig. The standard benjamina is very stately, with trunk shoots that may be elegantly (artificially) woven and a distinct, wafered green canopy above. Not all Ficus varieties have this woven trunk however; some simply have multiple strands growing straight up, and their leaves begin low down on the trunk. Some forms are variegated: some simply have pale margins, while on ‘Starlight’ the leaves seem to have a lemony background on which green is artistically daubed. The variegated forms need more sun and are more temperamental than the all-green ones. Unlike the fig shrub, Ficus carica, this tree doesn’t produce fruit; but the ‘weeping’ part of its name can be confirmed by many gardeners, since not only are its branches slightly pendulous, but it also sheds ‘tears’ at the drop of a hat. Leaf-drop, whether continual or sudden, is a notable tendency of the plant. The best approach is to give it a reasonably sunny and draught-free location, with moderate watering (let the soil dry a little in between), and a spot that it can call its own for all time. Like a fine aged wine, the Ficus objects to undue movement. And if anything happens that it doesn’t quite like, then—you guessed it—some leaves will drop. But unless there is something seriously amiss, there will be plenty of new replacements. Good to know: The canopy of a Ficus is usually imperfect when you buy it, taking time to fill out and requiring pruning for a rounded, bushy shape. When you prune, you might want to have some strips of tissue handy, since the Ficus bleeds white sap when cut, and this can be nuisance if it drips on the floor or carpet. A bit of tissue stuck on the cut ends will save some tidying up. The bamboo palm, like the related Cataractum described below, is considerably less fussy than a Ficus, stays more reliably green, and is extremely low-maintenance. It looks exotic with its culms of bamboo-like stalks, and it works well both to enliven an empty corner or to help break up a space or provide a form of eye-distracting screen. Place this palm where it will receive moderately high but indirect light to moderate shade — but never full sunshine. Good to know: These plants like to dry out significantly between waterings, which should never leave them soggy. Err on the side of less water, less often. Mist weekly in low humidity conditions to avoid brown leaf-tips — but if yours isn’t a bone-dry environment, you don’t need to mist at all. If you want a dramatic plant for an empty corner, this, like the bamboo palm, is a great choice. The deep green leaves are highly tapered, and the shiny fronds spray upwards from the base, growing larger as they rise. Like other palms, this plant likes bright indirect light, so a window spot is fine as long as the sun does not come pounding in through it. Or consider putting it against a wall that enjoys some reflected light. Good to know: If the leaf tips brown because you’ve under-watered or haven’t misted the leaves, you don’t have to live with it. The plant will not be harmed if you artfully snip away the dead bits, and it will look much better.